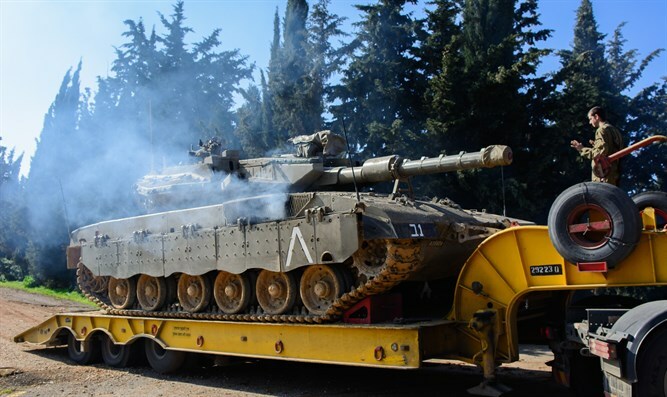 The IDF Spokesman confirmed to 0404 News that yesterday evening, while tanks were being transferred on carriers in a live-fire zone in the southern part of the country, a reserve battalion deputy company commander identified a partially conscious man holding military equipment near the tank. Military medical personnel were rushed to the scene to provide first aid. While the tank was being transported on the carrier the suspect boarded it in an attempt to steal military equipment and fell. The incident is being investigated by relevant IDF and Israeli Police officials. "It is unbelievable how Bedouin thieves don't fear the IDF," wrote 0404's correspondent Boaz Golan. "The theft of equipment from our fighters, especially in Tze'elim, has already become a palpable phenomenon. Even the Chief of Staff's decision to act against them through the open-fire regulations did not really affect the Bedouin, who know that a soldier will be afraid to shoot at them, since he's likely to be sent to jail and become a second Elor Azaria." After reserve soldiers loaded equipment on the tanks, the tanks were loaded onto the carriers and began to leave the area called "Chicago" - Tze'elim's live-fire zone. As the carriers began to leave Tze'elim, an ATV with two Bedouin approached them. The driver came alongside the carrier and his friend began to climb onto the truck and then boarded the tank itself. He then began to throw equipment from the tank's turret. His accomplice caught the equipment and waited for him. The company deputy commander drove up behind the bus carrier and suddenly identified the Bedouin in action. Realizing he'd been detected, the Bedouin decided to jump out of the tank - from a height of about five meters (including the carrier). The Bedouin hit the ground and was seriously injured while his friend fled with the ATV and equipment. The soldiers summoned an army ambulance to evacuate the Bedouin thief to Soroka Hospital, while sedated and put on a respirator. A reservist who was there told 0404: "What's happening here is beyond crazy. It's a real disgrace. The Chief of Staff must wake up quickly, because what's happening on site is terrible. The soldier's status has become a laughingstock. They treat us as if we were scarecrows in the middle of a garden - scarecrows only look scary, but pose no actual threat. It humiliates us and degrades all the service we've done up to now, and humiliates the Israel Defense Forces."